The Archbishop of Canterbury led a live-streamed Bible study on Facebook a few weeks ago. People logged in from all over the world, including the UK, USA, South Sudan, Pakistan, Nigeria, Australia, the Seychelles and Japan. At the time of writing, it has received 887,495 views, 3,920 shares, 3,910 comments and 20,128 reactions in the ensuing thread. Think about that for a minute: a spontaneous, unscripted, unpolished Facebook video of the Archbishop of Canterbury studying the Bible with the Rev’d Chris Russell, his adviser for evangelism and witness, reaches more people than attend a Church of England service on an average Sunday (currently estimated to be 760,000). There’s no intro/outro music, no ambient lighting, no contrived stage and no judicious editing. It is halting, occasionally awkward and a little untidy, with artless glances at people behind the camera and mysterious pieces of paper clumsily entering the frame. But it is all the more authentic and credible for that. In the coarseness of the technology and stiffness of the characters is a certain refreshing originality: there is reality and truth for the Word of Truth. This is not the Archbishop of Canterbury publicly proclaiming a crafted sermon of honed exposition and politic utterances, but Justin Welby muddling his way through the scriptures to discover more about Jesus. He then took live questions from some of those watching, so we have a feeling of muddling through the Gospel of John together. This week the Archbishop deployed Facebook again, for a live Q&A session and prayer with the Cardinal Archbishop of Westminster, Vincent Nichols, leader of the Roman Catholic Church in England and Wales. It was more awkward and bumbling than the Bible study, if not at times uncomfortably floundering. “I’m not quite sure,” said the Cardinal in response to one of the Archbishop’s questions. But it was authentic, casual, and ad-libbed, and all the more interesting and inviting for its un-contrived dialogue. At the time of writing, it has received 124,931 views, 697 shares, 785 comments and 3,579 reactions in the ensuing thread. That is more than a million people who have experienced something of the ministry of the Archbishop of Canterbury over the past fortnight, thanks to Facebook. And whenever has a bishop or archbishop used social media to minister to those who spontaneously seek fellowship? The Archbishop said: “You can spend ten minutes finding how each other is, ten minutes looking at a passage of the Bible – asking very simply ‘What does it say? What does it mean? What are we going to do about it?’ – and ten minutes praying together. It’s a really good way of spending time together.” But for those who can’t or don’t want to, you now have the option of cyber-Bible study and spontaneous chat and prayer with none other than the Archbishop of Canterbury himself. A great multitude (c5,000) followed Jesus out of the cities into the desert. He satisfied their spiritual hunger as well as feeding them all with bread and fish. 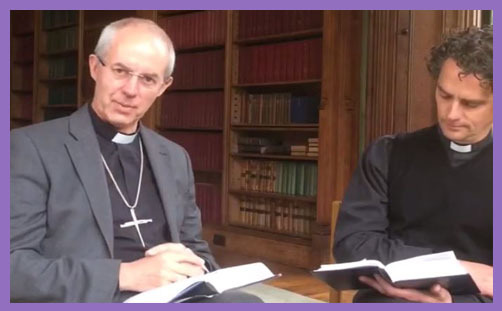 A great multitude follow Justin Welby on Facebook (c121,000) and Twitter (c91,000). The Archbishop can’t buy them all fish and chips, but he can and does offer an authentic gospel experience and plugs people into the plausible life of the Church. He ministers to his cyber-congregation with grace, telling the world about the man who hung on a cross and why we should seek and follow him. By searching the scriptures on social media, Justin Welby rehearses the word and works of the Risen Christ in community, drawing the world out of its parochial mindset into the catholic ambiguities of christological interpretation and the hermeneutic of the gospel. Justin Welby has planted a church on Facebook. The world is his parish.